We are taking the carbon from the local biomass (agricultural waste) and converting it into Biochar and carbon dioxide. The process uses a combination of both Pyrolysis and Gasification technology to produce a syngas fuel containing both Hydrogen and Carbon Monoxide. The fuel can be used to generate electricity and create heat or the Hydrogen and Carbon Monoxide can be used in other more beneficial processes. The biochar is then used as a soil amendment and sequesters its carbon for 5,000 years. The Carbon dioxide is used to grow algae that will be made into a carbon neutral biofuel. The carbon modification facilities can be located through out the country allowing algae farming and the use of the local biomass. Micro algae which lives in water needs sunlight, some nutrients and Carbon Dioxide to grow and flourish. Every pound of algae requires a little more than 2 lbs. of CO2. The process that we consider the breakthrough will allow algae farms to be located almost anywhere. We use almost any type of dry biomass such as tumble weeds, wood, manure and other organic materials in a process of both gasification and pyrolysis that modifies the carbon. Gasification is very much like fire in that you have a reaction between organic molecules and Oxygen that produce heat, water (H2O) and carbon dioxide (CO2). But with gasification, Oxygen (O2) is rationed to the fire and since the carbon atom has a much stronger attraction to oxygen than hydrogen (H2) it strips the Oxygen from water. This results in the production of Carbon Monoxide (CO) and Hydrogen (H2), which are both flammable gases and can be burned. Pyrolysis is when organic biomass is heated without the presence of Oxygen (O2). The material breaks down into a syngas, a pyrolysis oil and biochar. The syngas and pyrolysis oil can be burned to produce electricity or used for other purposes. Biochar is a stable charcoal like material that when added to the soil will sequester carbon for thousands of years and is credited with greatly increasing soil fertility. The Carbon Modification process should also produce waste heat that can be used in the processing of the algae for oil and the production of a high protein feed. These by-products and the production of biofuels results in a high economic output. Another project of interest at Desert Sweet Biofuels is the vectoring of algae through Daphnia. 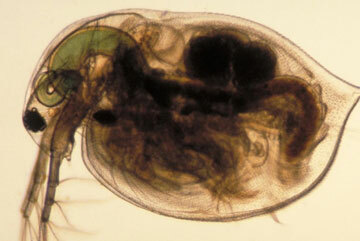 Daphnia is an aquatic animal about the size of a pinhead. They grow and reproduce rapidly on a diet of algae. They are high in protein and the percent of fat will vary with the fat content of the algae they eat. The cost of harvesting is very economical and they may play a large part in the Algae biofuel industry. The Science for the feasibility of growing algae for biofuels was accomplished between 1978 and 1996 by the U.S. Department of Energy's Aquatic Species Program. A link to the full report and other science is located at the bottom of the page. The high cost of algae production remains an obstacle. The cost analyses for large-scale microalgae production evolved from rather superficial analyses in the 1970s to the much more detailed and sophisticated studies conducted during the 1980s. A major conclusion from these analyses is that there is little prospect for any alternatives to the open pond designs, given the low cost requirements associated with fuel production. The factors that most influence cost are biological, and not engineering-related. These analyses point to the need for highly productive organisms capable of near-theoretical levels of conversion of sunlight to biomass. Even with aggressive assumptions about biological productivity, we project costs for biodiesel which are two times higher than current petroleum diesel fuel costs. What has changed is the current diesel fuel cost, in that the current price is more than 3 to 4 times higher than when the report was written. The current price allows us to have a lower solar conversion ratio and for it to still be practical to grow algae for diesel. With our existing infrastructure and experience in pioneering high intensity aquaculture in the desert, we believe that within two to three years we can answer most of the questions and prove that biodiesel from algae is practical at a scale needed to solve America's dependence to foreign oil. The U.S. Department of Energy’s Aquatic Species Program accomplished the Science for the feasibility of growing algae for biofuels between 1978 and 1996. A link to the full report and other science is located at the bottom of the page.